During the celebrations following the Installation of Brother Andrew A McKinnon as Right Worshipful Provincial Grand Master of the Province, held on the 12th June 2010, a raffle was run and due to the generosity of the Brethren from within the Province and the visiting Brethren from Grand Lodge and the Sister Provincial Grand Lodges, Brother McKinnon was able to present to the Urology Unit at Falkirk Royal Infirmary a cheque for the sum of £1000. Pictured below is Provincial Grand Master Bro. 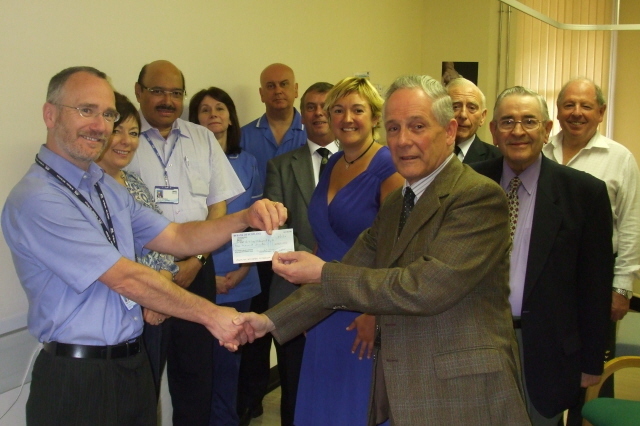 Andrew presenting the cheque to Mr. James Tweedle, Consultant Urologist at Falkirk Royal Infirmary on Tuesday 22nd June 2010. The Urology Unit propose to use the money to help buy a Laparoscopic Trainer. Also in the photograph are members of the Urology Unit and principals from the Provincial Grand Lodge of Stirlingshire. The picture has been reproduced with the kind permission of the Press Office at Forth Valley Health Service.